We offer a complete and comprehensive range of dental services for all our patients young and old. With a large team of doctors, specialists, hygienists and dental assistants all of the dental services you may need or want are available in our office. Our entire team’s goal is to provide these services to you in a friendly, caring and relaxing environment. We have an incredible team of doctors, assistants, specialists, hygienists and Patient Care Coordinators which allows us to provide you with complete and comprehensive dental services all in one convenient location. Improving your smile can be a life changing experience, making you look years younger, improving your self esteem, and making a positive change in your personal and business appearance. We have a full range of cosmetic dental procedures and expertise to create the smile you want, whether it is just one tooth or a full smile reconstruction. We offer beautiful life like porcelain crowns, veneers, bridges, implants, tooth whitening and invisalign. Ask us for a smile analysis and we will be glad to show you how we can help give you the smile of your dreams. Our goal is to always make you feel welcome, comfortable and relaxed. At your first appointment you will be greeted by one of our Patient Care coordinators and given an informative tour of our office. They will gladly answer all of your questions. There are no forms to complete, our team will simply ask you a few questions and enter all the information into our system. During your appointment you will get to meet the hygienist, doctor and assistants. Their focus will be to learn about your expectations and goals for your dental care. We will perform a thorough oral exam and evaluation. This will allow us to determine your dental and periodontal condition and present a treatment recommendations based on your goals for your dental health. We have a Endodontic specialist here at Arrowhead Dental Associates who practices state of the art endodontic treatment. He utilizes nitrous oxide sedation to ease patient anxiety during treatment. All of our doctors are qualified to perform extractions but we have a Board Certified Oral Surgeon on staff for more complex procedures like impacted 3rd molars and implants. Everyone knows how important getting a good night’s sleep is. Yet for many adults and their sleep partners snoring is a major problem, interfering with the quality of their sleep and relationship, more severe forms called sleep apnea can even lead to dangerous medical side effects. Arrowhead Dental Associates is pleased to announce that we offer custom made oral appliances that can be easily adjusted while in the mouth, this feature allows the patient to be in control of their treatment and fine-tune their treatment position at home to achieve maximum results. With Sleep apnea patients we will consult with your physician or sleep clinic to make sure your apnea is controlled. This device called a TAP appliance is the least invasive patient-friendly treatment solution for snoring and sleep apnea. It is a great alternative for patients who cannot tolerate the CPAP appliance. The TAP appliance helps to keep the patient’s airway open and improves their breathing while they sleep. Most patients experience relief the very first night they wear their TAP appliance. 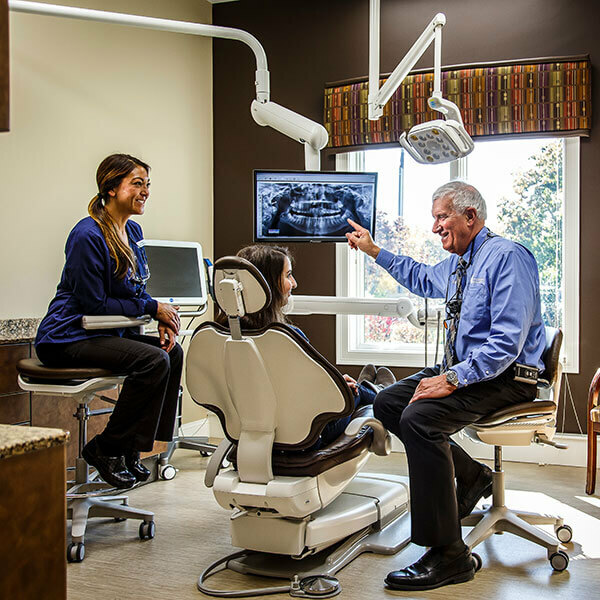 Our goal is your comfort and we realize some patients are very anxious when it comes to dental treatment, even having their teeth cleaned can be very stressful. We utilize a wide range of services to relieve this anxiety, such as nitrous oxide, oral premedication, topical and local anesthetics and TLC. Our oral surgeon utilizes IV sedation for 3rd molar extractions or for routine surgery if requested. But more importantly our office environment is very relaxing, many of our patients who previously needed deep sedation for dental work find they are now able to have treatment with just nitrous oxide and local anesthetic. Implants are now your best option for replacing a missing tooth or multiple teeth. They look and feel like your natural teeth. If you want to avoid removable partials or bridges, implants are the best choice. Our oral surgeon is an expert in the precise placement of dental implants. Once the implant adapts to the bone we are then able to follow it up with a beautiful life like crown, bridge or use the implants to securely hold a partial or full denture in place. We have added several new laser light technologies in our practice to make our dental treatment more comfortable, successful and precise. Crowns and bridges are now made with extremely accurate impressionless scans taken with our iTero laser scanner. Decay can be detected early with our diagnodent laser cavity detector. Periodontal disease can now be treated with a pain free non-surgical approach using the Perio-lase MVP-7 Laser. Treatment of many soft tissue conditions can be done painlessly using our laser technology. For patients who have lost many or all their teeth due to decay, periodontal disease or an accident we are able to replace them with life like partial or full dentures. These dentures can be further stabilized by having them attach to permanent implants eliminating loose fitting dentures or the need for adhesives. Attaching the dentures to carefully placed implants is becoming the standard of care and the best choice for our patients.